We are very excited to partner with Steven, Patricia and the team at Darlington Acupuncture and Massage Therapy. Prevention is becoming the medical priority in today’s culture, and we are no longer satisfied to accept detection, treatment or management of disease. We believe there is no reason to exaggerate the benefits of Thermography which is unique and beneficial enough to stand on its own merit. Our primary goal is to provide high quality, professional imaging services and a meaningful report to the patient and the referring doctor to support ongoing health assessment and prevention. The mission of Thermography Medical Clinic is to improve health outcomes by providing “The Future of Preventative Healthcare … Today!”. 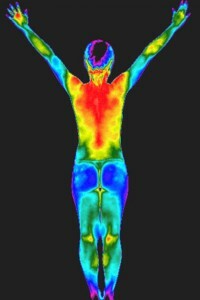 Medical Thermography is a unique technology that takes a picture and creates a map of the infrared patterns of the body. It is different than other screening tools because it helps us to see the metabolic processes and body functions.